The 2017 FFPC Superflex Best Ball roster construction analysis is a bit less conclusive than the regular Best Ball data. The sample size is much smaller, with only 35 leagues to analyze (420 total teams). Identifying winning roster construction, with only 35 leagues, does not lead to the identification of large pockets of successful combinations. However, we might be able to look at the win rates, just by position, and gleen some useful information. The Superflex format allows the use of 1 of the 2 Flex lineup spots to be used by a QB. Let’s look at each position in terms of the number of players drafted at a given position, and see which teams had the most success from that perspective. Rostering 4 or 5 quarterbacks seemed to represent the sweet spot at this position. Quite a few still had success with 3, but the success rate definitely sees an increase just beyond that. 7 running backs is the clear winner here. Teams with 6, 8, or 9 also won, but at lesser rates, and certainly below the 8.33 % benchmark (1 in 12 teams winning) used for average success. 7 or 8 wide receivers seems to be the best option here. Although the win rate was much higher (> 10%) at 5 or 6 wider receivers, the number of teams drafted with those numbers of wideouts was much smaller, which brings into the question of reliability given the smaller sample size. 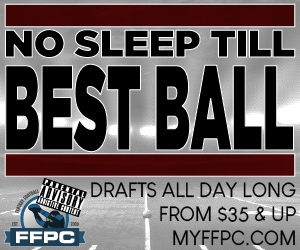 However 6 may still be worthwhile for a person drafting large numbers of Superflex Best Ball teams. 3 or 5 tight ends seemed to be the best choices at this position. Oddly, the selection of 4 seems suboptimal, coming in much lower at 6.11% than either 3 or 5. Similar to standard Best Ball, 3 or 4 kickers would be the best option. With a large quantity of teams drafted with 2, the low 7.18% number provide good confidence that 2 is a bad option. 3 Defenses seems to be the ideal number, however a few teams that rostered 4 of them saw strong success, in a limited sample size.